It has been 20 years since the publication of Arundhati Roy’s Booker Prize Winning first novel, The God of Small Things. It has been a long wait for those who were swept away by its haunting nature and the exquisite beauty. In the intervening years, Roy has published several works of nonfiction, much of it of a political and polemical nature. She has been described as a political activist, an anti-globalist, a critic of American foreign policy, and a leader of the opposition to a broad range of policies of the Indian government. 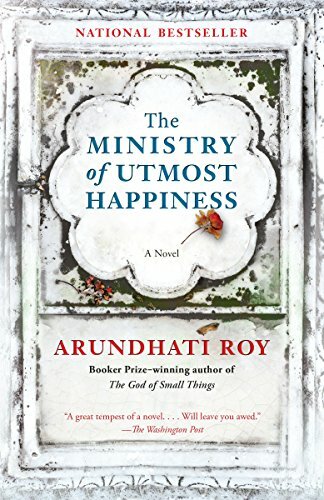 With the publication of The Ministry of Utmost Happiness, Roy has returned to fiction and produced another novel that is certain to either dazzle or befuddle those who admired her previous work, as well as those who are new to her work. There are five main characters and several other substantive ones, as well as a plethora of minor personages who float in and out of the story. The first of the main characters, Anjum, was born with ambiguous physical sexual identity and ultimately chooses to identity and live as a woman. She joins a Hijra (transgender) community for a number of years, but leaves and builds a life and community of her own in a graveyard. Anjum’s search for her identity is filled with anguish and suffering, and her remarkable story occupies the opening section of The Ministry of Utmost Happiness. Anjum’s life seems to be unrelated to the lives of the four other main characters. There are three men, Naga, Musa, and Biplab Dasgupta; and one woman, Tilottama(Tilo). These four are friends from college days when they worked together on a play that never reached a public performance. Their lives move in different, but somewhat related directions, over two decades and propel the action of the novel. In the end their lives cross and intersect within a world of politics, violence, and ethnic strife in India, Pakistan, Kashmir, and Afghanistan. The one thing all have in common is the sectarian violence, the political corruption, and the terror visited on them by the revolutionaries, jihadists, and the state. Related to these are the corruption of individuals and institutions that add to human suffering, as well as the dead hand of indifference allied with capitalism. It is a brutal world of random violence and death delivered without differentiation of the innocent and the not so innocent. This is a chronicle of broken and shattered lives, of survival, and of coping. The only salvation is found in human kindness that keeps the flame of individual dignity alive within the Ministry of Utmost Happiness. This is not an easy read. It does not flow along smoothly. There are changes of narrators and time jumps backward and forward over decades. Characters abound and are unceasingly interesting, but they come and go, and do not always return. Diversion and digression are commonplace, and there are times when it seems as if Roy has opened her notebook, grabbed whatever is handy, and thrown it on the page. However for the most part that is not the case as even seemingly irrelevant diversions illuminate the meaning of some aspect of the novel. Those looking for traditional plot and narrative will be frustrated. What makes this novel so unforgettable and so important is the electric prose, the beautiful phrasing, in short, the brilliant writing of Arundhati Roy. Her powers of description are a strength, but what pushes this novel beyond good is Roy’s ability to use just the right phrase in the right place, the brilliance of a metaphor, and the ability to reach the heart with both beauty and horror. The overall conception of The Ministry of Utmost Happiness is the product of creativity and imagination that lifts itself beyond the boundaries of logic and order. Roy’s insight into the absurdities of modern life and the contradictions imbedded in the norms of our world are as powerful as fiction can be, and an urgent call to the human spirit that Roy locates among the most humble in the human family.